Next on my custom cabinets I am going to finish manufacturer my box. Previously, the cabinet maker cut the plywood for his bottom and he is going to start his commencement of the custom job by placing the plywood in the box cabinets. The wood worker is going to nail the custom cabinets together with a nail gun. Now they delivered some self assembly boards for my custom cabinets that I can put together for my drawers. I have to make sure that I create the drawers in such a way that they will fit in my custom cabinets. Right now I am going to accumulate my first drawer. I was making these short pieces into the faces and joining them so that the board is on the inside of the short piece. But if you want you can make them on the outside piece instead it will work either way because of the sliders that we use. The strips the cabinet maker is cutting right now are going to be the base of the custom cabinets. I’ve already cut pocket holes in the sides that conjoin with the kitchen. What I need to do on mine is cut a hole in the piece for the front of my custom cabinets is going to be used for a vent because there’s a heating duck that comes right behind all of the custom cabinets. I’ll give it some extra support with these little corner blocks and I’ll hold them in place with glue then nail them in with a nail gun. The cabinet maker will have the dimensions and boards cut out rapidly then we can follow up with my last written information. That give us the back frame of my custom cabinets. Which is the formation of the kitchen's layout. 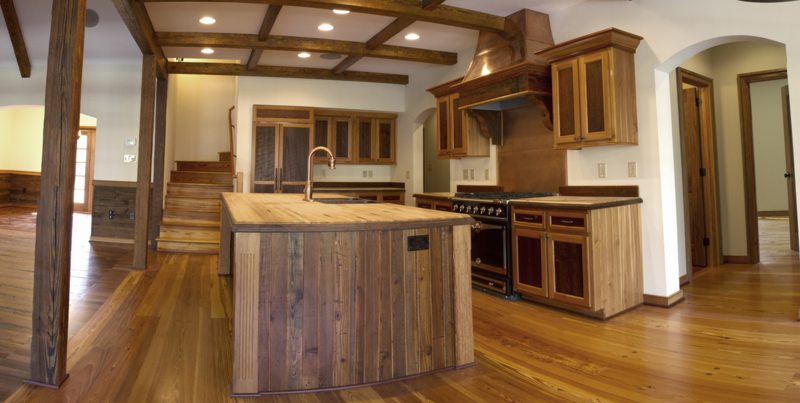 The bocote wood used for the custom cabinets was harvested in Katy, TX. They had the initial color paint for the inner wood and a lighter shade for the frames.